Linear Projection is a widely used algorithm often implemented with high throughput requisites. 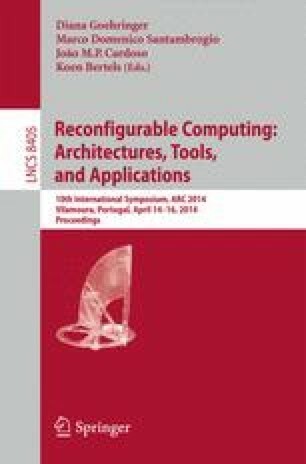 This work presents a novel methodology to optimise Linear Projection designs that outperform typical design methodologies through a prior characterisation of the arithmetic units in the data path of the circuit under various operating conditions. Limited by the ever increasing process variation, the delay models available in synthesis tools are no longer suitable for performance optimisation of designs, as they are generic and only take into account the worst case variation for a given fabrication process. Hence, they heavily penalise the optimisation strategy of a design by leaving a gap in performance. This work presents a novel unified optimisation framework which contemplates a prior characterisation of the embedded multipliers on the target device under PVT variation. The proposed framework creates designs that achieve high throughput while producing less errors than typical methodologies. The results of a case study reveal that the proposed methodology outperforms the typical implementation in 3 real-life design strategies: high performance, low power and temperature variation. The proposed methodology produced Linear Projection designs that were able to perform up to 18 dB better than the reference methodology. Lascar Electronics. El-usb-tc k, j, and t-type thermocouple temperature usb data logger, http://www.lascarelectronics.com/temperaturedatalogger.php?datalogger=364.